For those who have never heard of Mesquite, the city is located on Interstate 15 to the east of Las Vegas, near the Arizona and Utah border. It sits in the Virgin River Valley. Unlike so many other Nevada cities, Mesquite wasn’t founded as a mining boom town. Instead, Mormons from Utah founded the city (then called Mesquite Flat) in 1880. The city itself remained a small agricultural town until the 1970’s, when the first casino opened. Others soon followed, taking advantage of the city’s close location to the Utah border. The 2000’s really saw the boom of Mesquite. Taking advantage of the very warm weather, relatively scenic location, and the lower cost of living in comparison to many other Sunbelt retirement areas, retirees started to flock to Mesquite. As such, new developments of townhomes and second homes sprouted up everywhere. The weather in Mesquite is, in a word, hot. The elevation of Mesquite is only 1600 feet, which is lower in elevation than Las Vegas. Summer weather is in the 100’s, with warm evenings. Of course, the benefit of hot summer weather is that Mesquite has mild winter weather. Mesquite has many hotels and casinos. 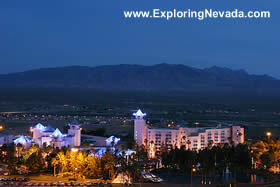 Unlike Las Vegas, most of the hotels and casinos in Mesquite are affordable. The Mesquite casino’s also aren’t the massive complexes found in Las Vegas. For this reason, the hotels and casinos in Mesquite – similar to those in Laughlin – are quite popular among retirees and older people seeking a more laid-back and affordable alternative to Las Vegas.